In the third week of May, it was warmer in Fairbanks, Alaska, than in Washington, D.C. The small town of Eagle, Alaska, was hotter on May 23 than it has been on any day in Houston or Dallas this year. 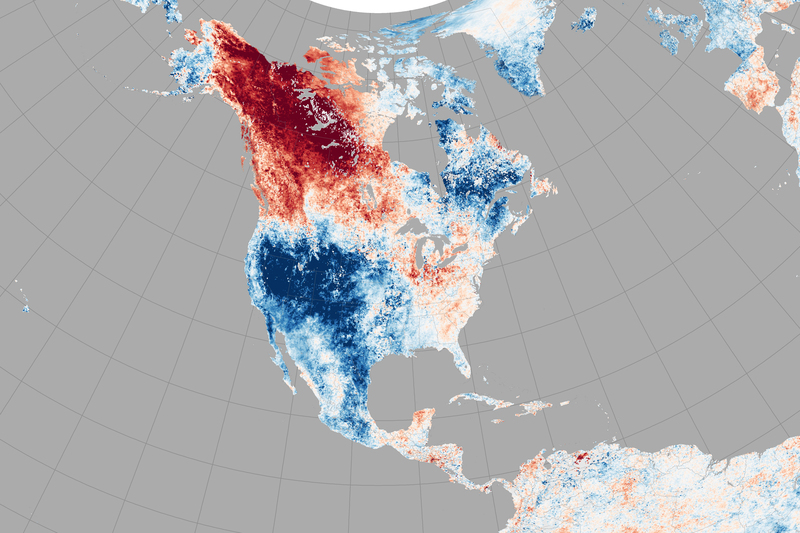 In what has become a frequent occurrence in the past few years, temperature profiles in North America appeared to be upside down. 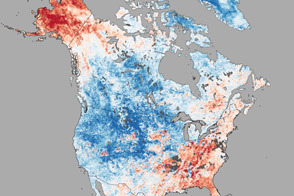 The map above shows North American land surface temperatures from May 17–24, 2015, compared to the 2001–2010 average for the same eight-day period. Shades of red depict areas that were hotter than the long-term average; areas in blue were below average for the week. White pixels were normal, and gray pixels did not have enough data, most likely due to excessive cloud cover. 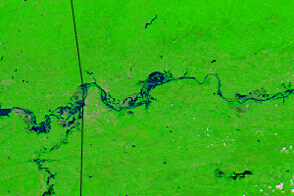 To the south and east, at least 12 temperature records were set in Canada’s Yukon and Northwest Territories. Temperatures in Faro reached 81.3°F (27.4°C), 14°F (7.5°C) above the old record. With humidity levels between 10 and 20 percent, civil agencies warned of wildfire. At least 31 fires were reported in the Yukon alone as of May 24. 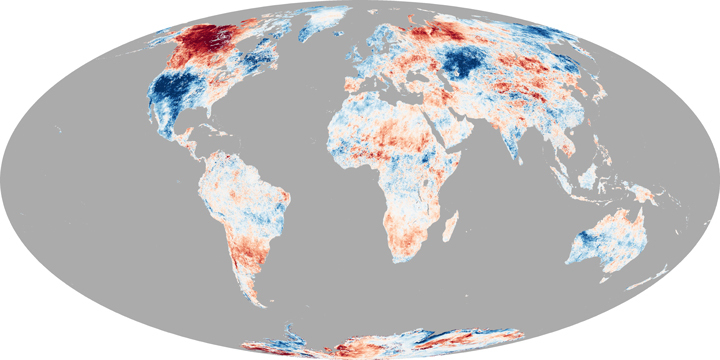 According to several meteorologists, the unseasonable heat wave has been caused by a kinked jet stream that is sending air masses in a more north-south flow than the more typical east-west direction. The pattern of the jet stream may be related to atmospheric waves and circulation stirred up by the remnants of Typhoons Noul and Dolphin. The global view of land surface temperatures for May 17–24 (below) reflects cooler temperatures in eastern Canada, where vineyards lost some of their crop due to late-season frost. In the southwestern United States, cooler temperatures and data gaps reflect the persistent cloud cover and rainfall over much of the area. 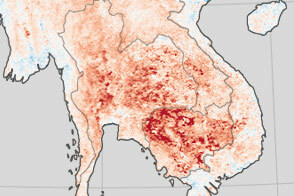 Around the world in southern Asia, however, the LST map shows its limitations. India has also been caught in a heat wave. 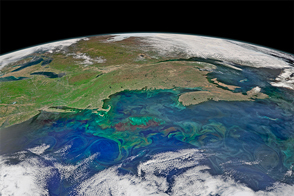 However, the MODIS sensor did not observe a single cloud-free day across the entire country in the eight-day period. Cloudy patches on different days over different parts of the country may have caused the heat signal to be smoothed out. It is also possible that warm, humid air masses were more responsible for the heat wave than direct solar heating of the ground. Either way, daytime land surface temperatures did not register as anomalous compared to other years. 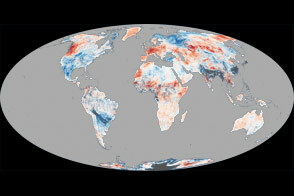 NASA Earth Observatory maps by Joshua Stevens, based on land surface temperature anomaly data from the NASA Earth Observations (NEO) Website. Caption by Mike Carlowicz. The small town of Eagle was hotter on May 23 than it has been on any day in Houston or Dallas this year. CBC News (2015, May 24) Yukon’s record breaking temperatures enter second week. Accessed May 26, 2015. CBC News (2015, May 26) Temperature plunge leaves Ontario vineyards scrambling to prevent crop damage. Accessed May 26, 2015. Fairbanks Daily News Miner (2015, May 24) Record-high temperatures in Interior Alaska; crews keep a lid on wildfires. Accessed May 26, 2015. National Weather Service, Fairbanks, Alaska (2015, May 24) Public Information Statement. Accessed May 26, 2015. 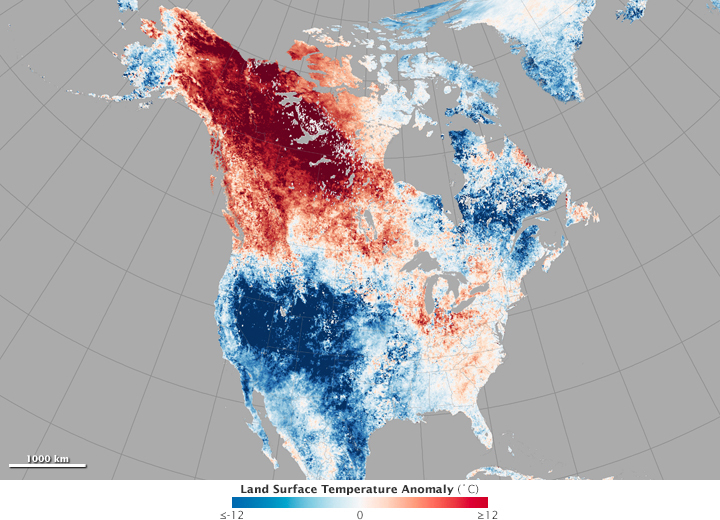 The Washington Post (2015, May 26) Alaska recorded it’s hottest temperature so early in the season Memorial Day weekend. Accessed May 26, 2015. 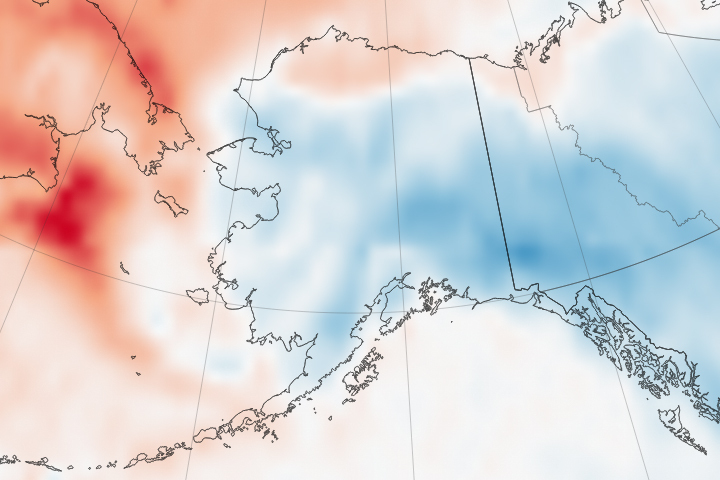 The Washington Post (2015, May 22) Record heat roasts parts of Alaska, where it’s warmer than Washington, D.C. Accessed May 26, 2015. The Weather Channel (2015, May 25) Barrow, Alaska: The Last Place You’d Expect to Find Record Warmth. Accessed May 26, 2015.